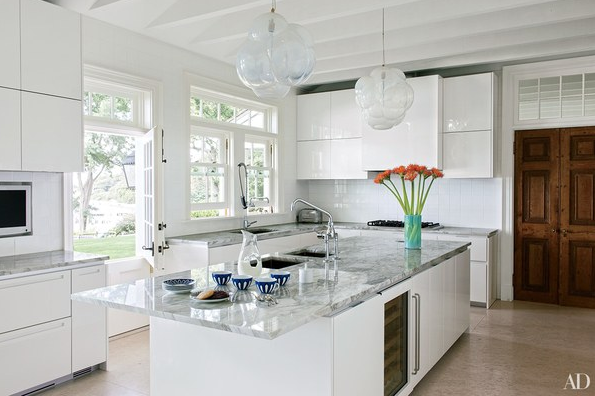 There’s a reason white kitchen cabinets have been a favorite of designers and homeowners for years. 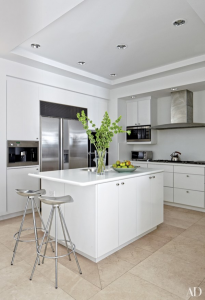 White cabinets add brightness (and storage) for a crisp, clean look that works with a range of styles, from streamlined and contemporary to refined and traditional. 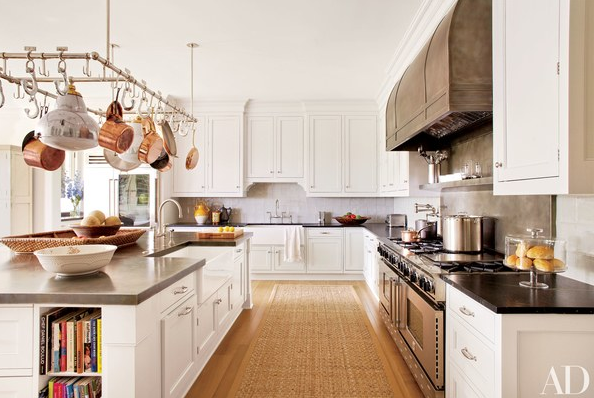 These rooms from the archives of Architectural Digest offer an array of ideas for creating a kitchen that uses white cabinetry to beautiful effect. Read on to find inspiration for your next kitchen refresh from top designers such as Elissa Cullman, Shawn Henderson, Alex Papachristidis, and Vicente Wolf. In the kitchen of an Aspen home designed by Shawn Henderson, a vintage Louis Poulsen pendant light from Lost City Arts hangs above a Caesarstone-top island and Orange Furniture barstools upholstered in an Edelman leather; the hood is by Bulthaup, the cabinetry is by Studio B, the ovens are by Gaggenau, and the sink fittings are by Dornbracht. 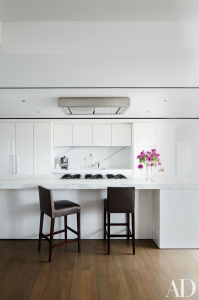 In accessories designer Fiona Kotur’s Hong Kong residence, the kitchen cabinetry was conceived by Kotur and architectural designer Alexander Stuart; a lithograph by Mary Evancho overlooks a slate countertop. 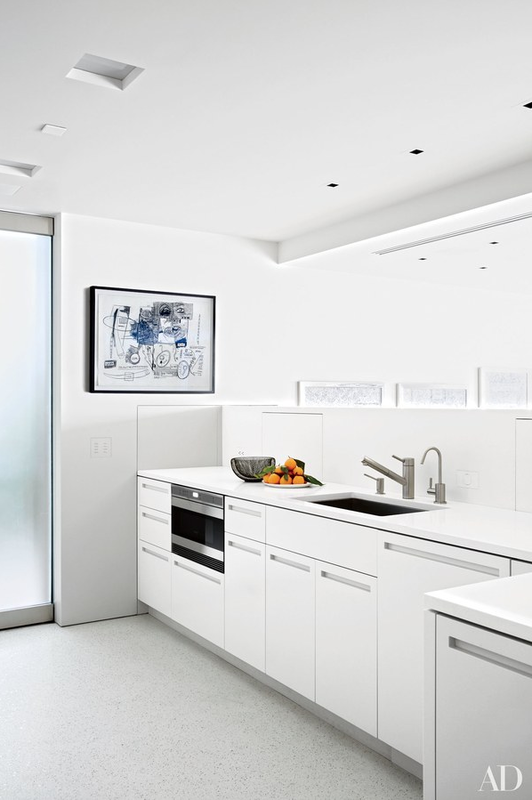 In collector Chara Schreyer’s gallery-like Los Angeles home, decorated by Gary Hutton Design, the kitchen features a Jean-Michel Basquiat drawing and is appointed with Caesarstone counter-tops, KWC sink fittings, and a Wolf microwave. In the kitchen of the Martha’s Vineyard retreat of Lynn Forester de Rothschild and her husband, Sir Evelyn, a Ralph Lauren Paint white was used on the Rivkin/Weisman–designed cabinetry, and the antique granite flooring is from Exquisite Surfaces. The pot rack is from Ann-Morris, the reclaimed-oak open shelves feature brackets by Rocky Mountain Hardware, and the backsplash tile and farmhouse sink are by Waterworks. Architect Hugh Weisman and decorator Mark Cunningham renovated the home. 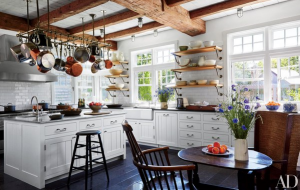 Dodie Thayer lettuceware contrasts beautifully with the white shelving and cabinetry in the upstate New York kitchen of lighting designer Christopher Spitzmiller. 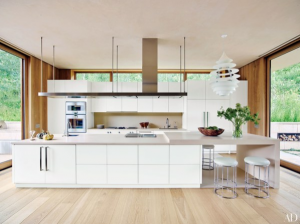 The kitchen of a Martha’s Vineyard home designed by Ariel Ashe and Reinaldo Leandro features a Sub-Zero refrigerator, a Wolf range, and Dornbracht sink fittings; the minimalist pendant lights are by Davide Groppi, the Bernard-Albin Gras sconces are by Design Within Reach, and the barstools are by Garza Marfa. Holophane lights by Ann-Morris are installed in the kitchen of a Manhattan penthouse renovated by architect John Murray and decorator Elissa Cullman. The cabinetry, designed by Murray, is accented with hardware by the Nanz Co.; the wall ovens are by Wolf, the cooktop is by Viking, the pot filler is by Rohl, and the counter stools are by Cliff Young. 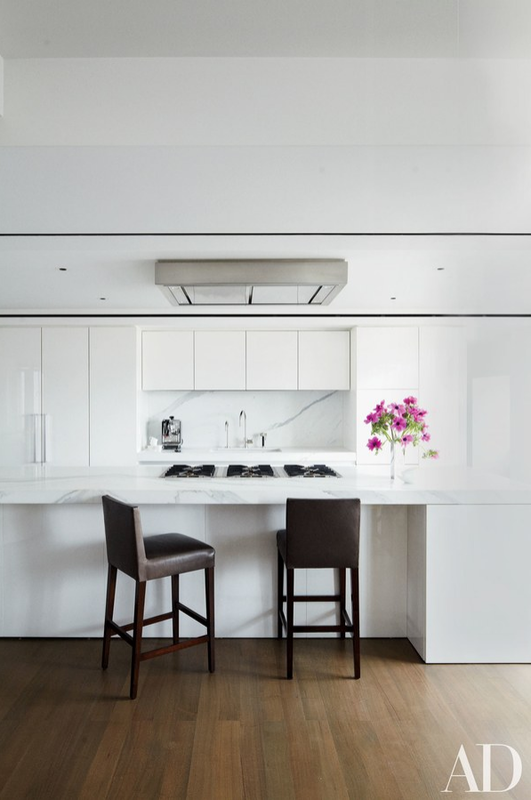 Calacatta marble complements the Boffi cabinetry in the kitchen of a New York apartment designed by architect Russell Groves; the cooktop and panel-clad refrigerator are by Gaggenau, and the espresso machine is by Nespresso. A bespoke Ann-Morris pot-rack light fixture is suspended in the kitchen of a chic Hamptons retreat decorated by Carrier and Co.; the backsplash tiles are by Country Floors, and the double range is by BlueStar. 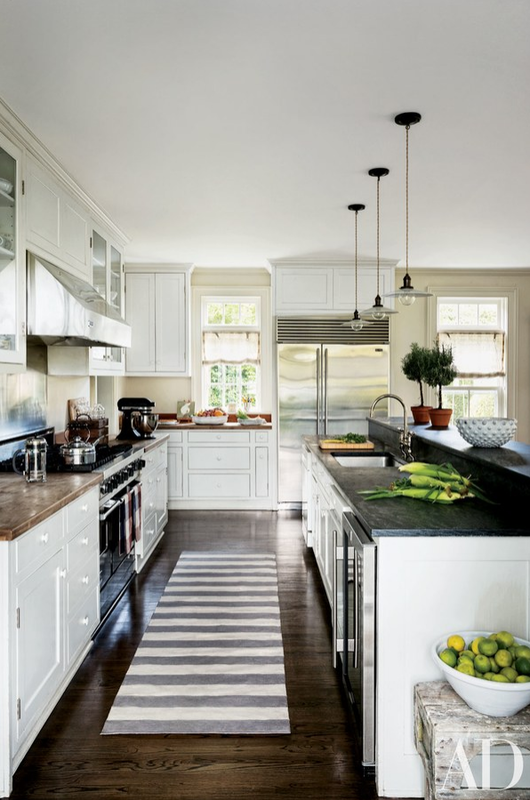 A trio of pendant lights from Laurin Copen Antiques hangs in a Bridgehampton retreat’s kitchen, which is outfitted with a Sub-Zero refrigerator and wine cooler, a Viking range and hood, and a Madeline Weinrib rug. 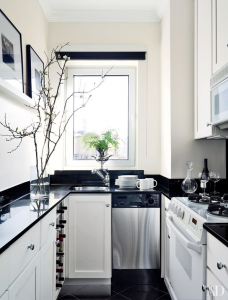 The kitchen of a New York townhouse renovated by architect Peter Pennoyer and designer Shawn Henderson includes a Sub-Zero refrigerator and a Wolf range and wall ovens; the antiqued-mirror backsplash tile is by Ann Sacks, the sink fittings are by Waterworks, and the stools are from Mark Jupiter. The kitchen of a New Jersey estate renovated by architect Annabelle Selldorf and designer Matthew Frederick features a Gaggenau cooktop and wall ovens and Dornbracht sink fittings. 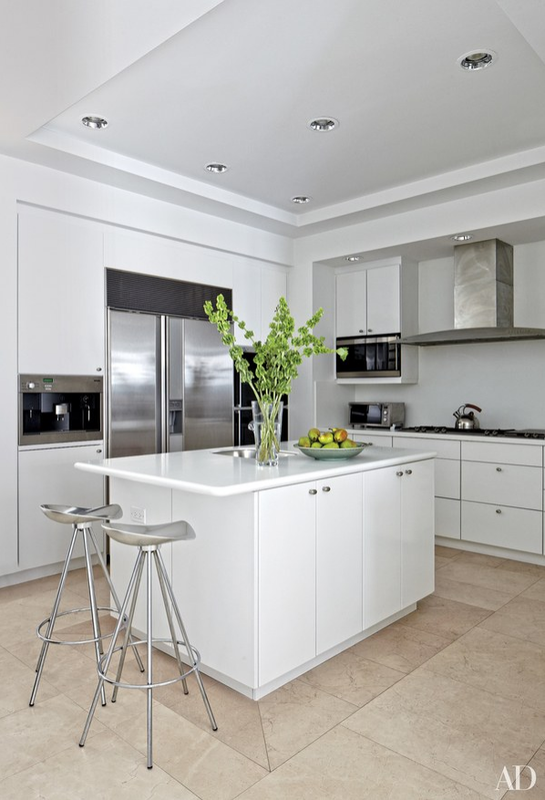 The kitchen and breakfast area of a London home by decorator Hubert Zandberg and architectural designer Jan Swanepoel features white cabinets and Cox London light fixtures. 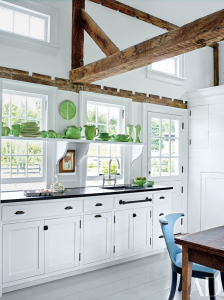 The kitchen in late fashion designer Vince Camuto’s Hamptons estate, painted in a Benjamin Moore white, features custom-made holophane lights by Ann-Morris Antiques and cabinetry by Eppley Building & Design; the oak bench and ebonized bobbin chair are antique. 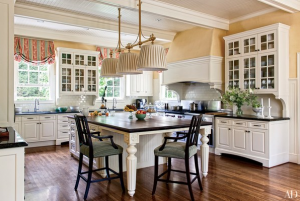 The kitchen in a Shelter Island, New York, home designed by Russell Piccione features Boffi cabinetry and Jeff Zimmerman pendant lights; the cooktop is by Viking, and the porcelain tableware is by Hermès. The kitchen of this Southampton, New York, home designed by Juan Montoya is painted in a Farrow & Ball white and features Roman shades in an Old World Weavers fabric. 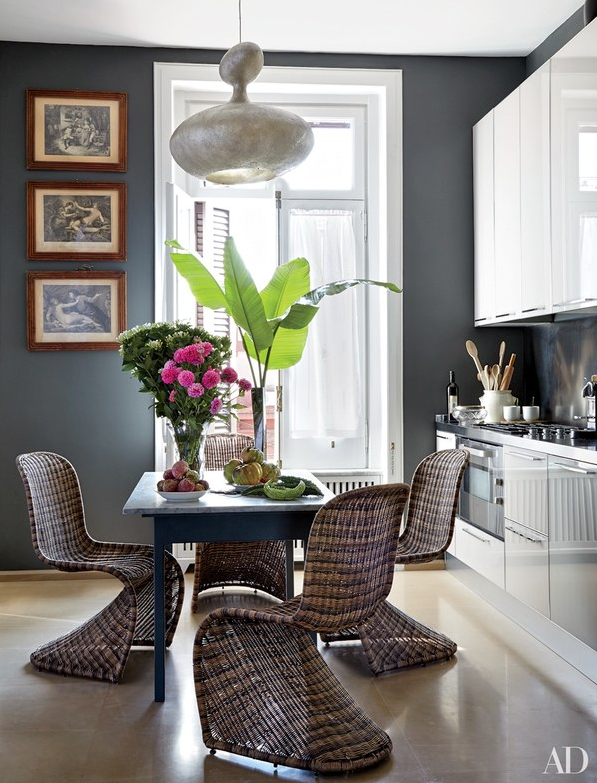 A 1970s ceiling light joins 18th-century prints, Verner Panton chairs, and sleek cabinetry in the kitchen of designer Allegra Hicks’s penthouse in Naples, Italy. 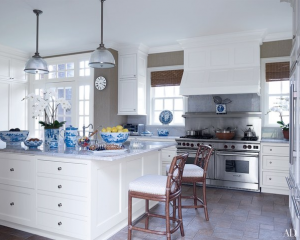 In decorator Alex Papachristidis’s Hamptons kitchen, the stools are by Laura Kirar for McGuire, the blue-and-white china is by Mottahedeh, and the range is by Wolf. 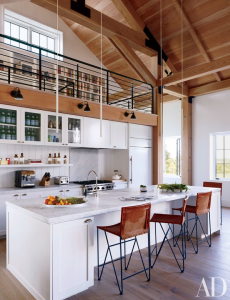 Jacobsen Architecture designed the cabinetry and the marble-top island with an incorporated dining table in the kitchen of a Napa Valley home. The cooktop is by GE Monogram, the Mies van der Rohe chairs are by Knoll, the metal sculpture is by Bret Price, and the framed silkscreen is by Gene Davis. 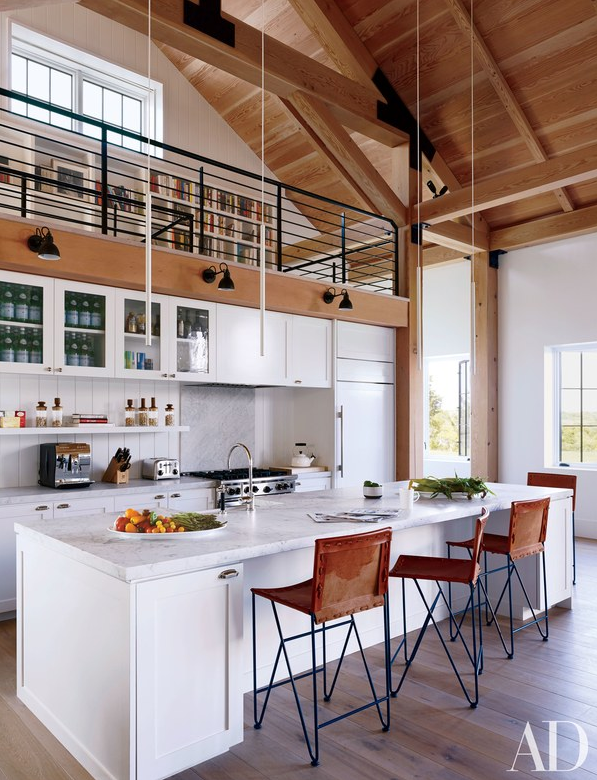 Bespoke cabinetry and a Campana Brothers suspension light enliven the kitchen of a rural Connecticut estate designed by India Mahdavi; the stools are by BassamFellows from Design Within Reach, the Eames side chairs are by Vitra, and the oven is by Miele. 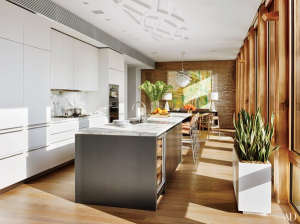 Marble surfaces complement Bulthaup cabinetry in a Manhattan kitchen designed by Greg Dufner and Daniel Heighes Wismer. The space is equipped with Miele wall ovens, a Gaggenau cooktop, Dornbracht sink fittings, and a Sub-Zero wine refrigerator. 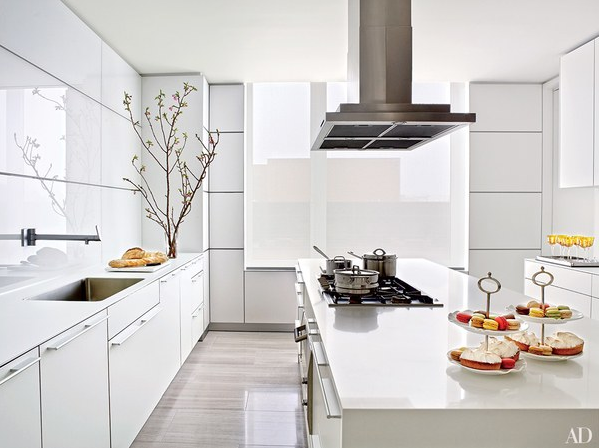 White cabinets line a Florida kitchen designed by Vicente Wolf; the refrigerator is by Sub-Zero, the coffee machine is by Miele, and the Knoll stools are from Design Within Reach. In a Nantucket, Massachusetts, kitchen designed by Jacobsen Architecture, glossy white cabinets are a counterpoint to the walnut-top table with acrylic supports and four walnut benches, all by Hudson Furniture. 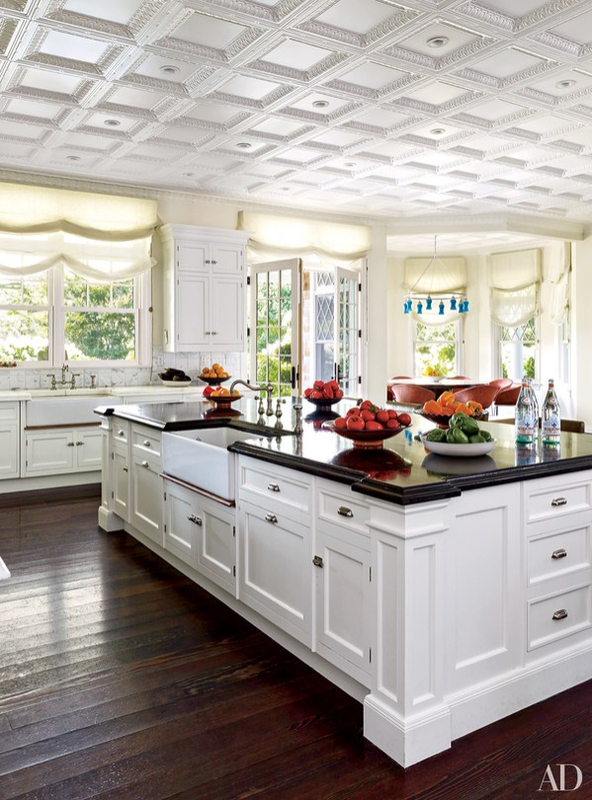 An Ann-Morris light fixture presides over the kitchen island in a Bay Area home designed by Douglas Durkin. The space also includes a Waterworks-tile backsplash, a Wolf range, and Erika Brunson chairs upholstered in a Rose Tarlow Melrose House fabric. 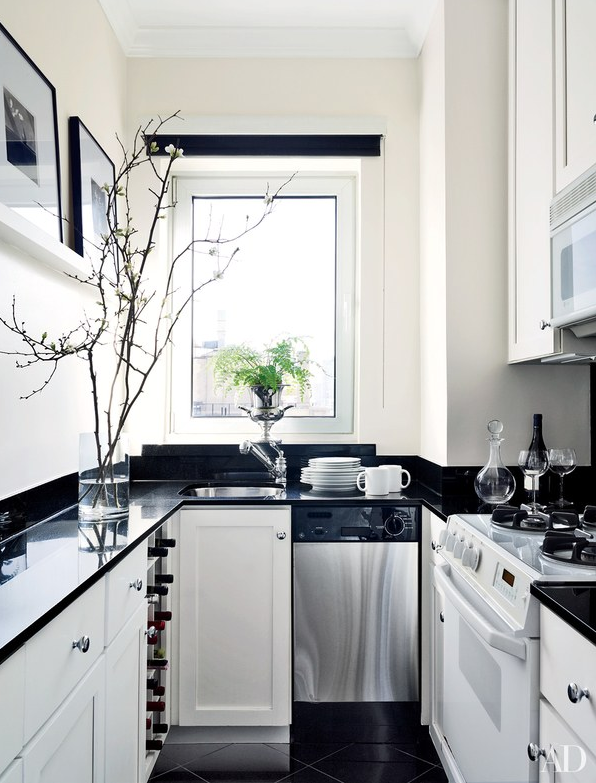 Designer Larry Laslo updated the galley kitchen of a New York apartment with a black-and-white palette. In a Washington, D.C., apartment by the design firm Solís Betancourt & Sherrill, the kitchen’s cabinetry, sink, and sink fittings are by Bulthaup, while the hood and appliances are by Gaggenau. ALL AVAILABLE AT KITCHEN EXPO! !